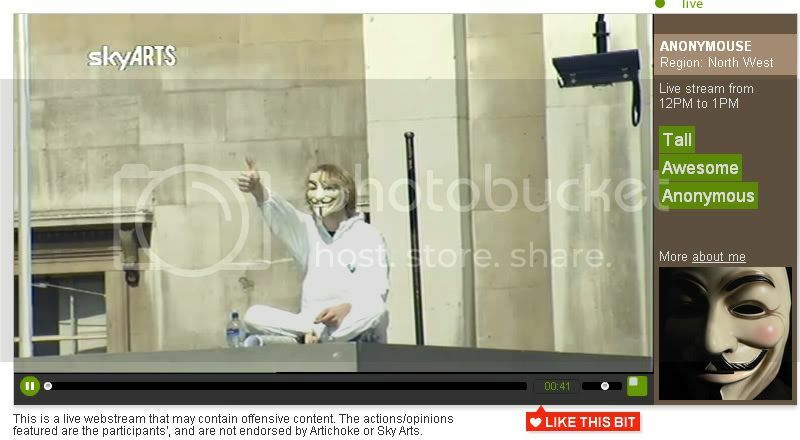 At 12pm London time, Anonymous, in the form of "Anonymouse", appeared on the 4th plinth at Trafalgar Square. After initially chillin to some mp3 tunes on is earplants, over the course of the hour, Anonymouse produced a series of signs with messages for the audience and for scientology. Nor do we like you disconnecting families from their loves ones. WE don't like being called terrorists. We like peace and puppies and kittens. You love money and control. You are shrouded in mysterious deaths. Why are they dead? It is time to give up your control. We will not stop until all are saved. We are anonymous and we love you. Even though we argue, You are our brothers and sisters. To protect our identities. We are aware you don't take criticism kindly. You will follow us and Fair Game us. ......."
Anonymous wrote: We all need to get in the draw urgently. And just to rub some salt into the wounds, a call will be placed in to TCR exactly 60 minutes before we go on the podium so they have time to pop down and enjoy the experience. Firstly I know I should be posting this in post-game reports but balls to it. I was nervous as hell all week leading up to it and had to make sure that a lot of planning went into not only the protest but also the exit. Oneandother we're absolutely brilliant. I explained everything to them and they worked together to protect me. A special shout out to that awesome security lady, you know you are. One anon working on the ground in the crowd identified (myself as well) a member of OSA. This was annoying but inevitable. The cool awesome security chick warned me they wanted an interview and they weren't happy with what they saw of the protest. Intelligence from the ground indicates that these two (man and woman) are in Scientology still (the man has long grey hair) he also had an awesome camera and a massive frown. Bless. Thank you security chick! Also a special thanks to the other anon who kept an eye out for my escape plan, your counter-surveillance skills are an inspiration. Anyways, the plinthery was amazing, it's an incredibly surreal experience seeing photos of yourself on different websites and forums and no-one knowing who you are. It's a very good feeling. Thank you guys for your support, it would have been better if a few more anons turned up but the crowd was 99% supportive throughout, an awesome day and I hope I see more soon. Last edited by Sponge on Thu Aug 20, 2009 5:20 am, edited 1 time in total. Thank you, Sponge! Such interesting new information, brought to us so regularly by ... Yours Truly! Love it. And thank you again for all you do to keep bringing these to us on a daily basis!!! I couldn't keep up these days without your daily updates. You beauty! That is fantastic!I'm sure it will generate tons of publicity.The plinth concept doesn't seem to have been used for anything of great interest so far..I love it! It's a shame that the signs weren't bigger and made of some sturdy card so they would have been easier for the public to read..
Can't wait to see pics of the DM one! antiscn, yeah, the level of mediocrity so far had been yawnworthy. Nice to see something for the good. BTW the OP has been updated with a post game report from EpicPlinthMan. Thank you SO much Sponge for transcribing that. For the person that did it: Fantastic!! !